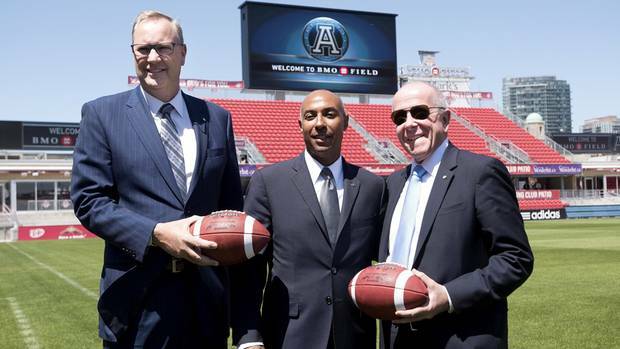 Sixty-five years after watching his first Toronto Argonauts game, Larry Tanenbaum is taking the storied franchise back home. Tanenbaum, the chairman of Maple Leafs Sports and Entertainment, was introduced Wednesday along with Bell Media as the new owners of the CFL club. And they’ll relocate the 142-year-old franchise to BMO Field, pending renovations to accommodate football, starting next season. A return to the lakefront soccer stadium is significant because it’s located at Exhibition Place, the same grounds where the Argos thrived in the 1960s and ’70s before relocating to Rogers Centre in 1989. But Tanenbaum’s association with the Argos goes back even further to the 1950s when they played at Varsity Stadium. It’s at that time the chairman of Kilmer Van Nostrand Co. Ltd., a Toronto-based investment company, dreamed of one day owning the CFL franchise. “It’s every kid’s imagination; you’re either playing or owning the team,” Tanenbaum said during the news conference at BMO Field. “I couldn’t play, so I’m glad to be able to own the team. The transaction is expected to close Dec. 31 with BCE and Tanenbaum working closely with present owner David Braley this season. The Argos will play at Rogers Centre this season. Bell Media’s parent company, BCE, owns 15 per cent of The Globe and Mail. The Argos’ lease at Rogers Centre, also the home of baseball’s Toronto Blue Jays, was scheduled to expire after the 2017 campaign. But they had the option to leave earlier if they found a new home. “When I purchased the Argos [in 2010], I thought it would be a two- or three-year journey and I’d have the problem solved,” Braley said. “Under Bell and Larry Tanenbaum’s ownership, the Argos have a very bright future. Braley, a Hamilton businessman, fondly remembers watching his hometown Tiger-Cats facing their arch-rivals at Exhibition Place. Wednesday’s announcement capped roughly a year of talks between Braley, who also owns the B.C. Lions, and MLSE. “My mother used to bring me over from Hamilton and we’d watch the games around the 10-yard line,” he said. “To be playing at the same location is something special. The sale and relocation of the Argos would appear to resolve the CFL’s issues in Southern Ontario. Last year, the Ticats moved into their new facility, Tim Hortons Field. Absent from the deal is Rogers Communications, which is part of the MLSE ownership group with BCE and Tanenbaum. Rogers, which owns Rogers Centre and the Jays, was reportedly not interested in acquiring the 142-year-old franchise, likely because it has no ties to the CFL while BCE has a vested interest through its broadcast affiliate TSN. Fans have long complained about the lack of atmosphere at Rogers Centre, where Toronto averaged less than 20,000 spectators last year in a stadium that can hold more than 50,000 fans for football. Also, the Argos have found it difficult to secure decent home dates because of stiff competition from baseball and special events. In a glaring example of that, the Argos were forced to schedule their 2015 home opener against Edmonton in Fort McMurray, Alta., because of conflicts with the Pan American Games and Jays. Such logistical nightmares for North America’s oldest existing sports team are unlikely at BMO Field. While Major League Soccer’s Toronto FC will remain the stadium’s primary tenant, it requires far fewer home dates than the Jays. Some soccer fans oppose the conversion of BMO Field for the Argos, contending CFL play will impact the quality of the playing surface. But Tanenbaum said those concerns are unwarranted. “I don’t believe they should have anything to be worried about,” he said.